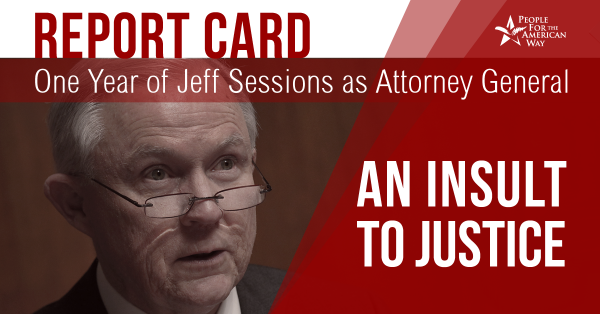 Our country’s Department of Justice was meant to safeguard the rights of all Americans. DOJ has the monumental responsibility of ensuring that civil rights protections are enforced, especially for those who are too often the target of civil rights violations, like Black Americans and other people of color. Unfortunately, under the leadership of Attorney General Jeff Sessions, the Justice Department has already made all too clear its intent to walk away from this critical work and take our country in reverse. PFAW will not stand idly by while President Trump and Attorney General Sessions abandon the Justice Department’s legal and moral responsibility to uphold core constitutional principles. The Justice Department has played an essential role in protecting Americans’ civil rights, especially at times when state and local officials have been disinterested or actively hostile toward them. The achievements of the civil rights movement were met with massive resistance from those unwilling to abandon an unjust status quo that offered them privilege and power. The federal government, under presidents from both parties, stepped in to overcome that resistance. But, it has also become disastrously clear that progress is reversible. Today’s DOJ is abandoning its obligation to protect voting rights and is returning to a mass incarceration model of law enforcement that has been recognized across the political spectrum to be devastating to people of color and their families. 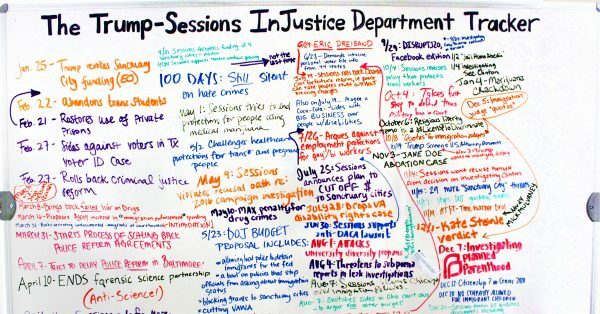 The year Sessions, then a U.S. attorney, led a witch hunt against three voting rights advocates.